WHAT: Join us for Opening Night of the 2019 Los Angeles Times Food Bowl. The evening will begin with Mesamérica L.A. at the Million Dollar Theatre in downtown Los Angeles. Mesamérica L.A. is the first incarnation of chef Enrique Olvera’s celebrated symposium to be held outside of Mexico. Olvera and L.A. Times Food Editor Peter Meehan have curated a program that explores the culinary and cultural interconnectedness of Mexico City and Los Angeles to celebrate the sister cities’ 50-year anniversary. Art, architecture, identity and the meaning of tacos will be explored through talks, video and song. Following Mesamérica L.A., a DFiesta progressive party will take place next door at Grand Central Market and at the nearby La Cita Bar. Most of the market will feature for-purchase chef collaborations, roving Mariachi bands and other Mexico City-inspired merriment. Purchase of a DFiesta ticket will include access to a curated section of the market featuring special one-night-only offerings from the restaurants listed below. The DFiesta will continue with post-reception cocktails and entertainment at La Cita Bar, just south of the market. Mesamérica L.A. tickets are $35 each. Mesamérica L.A. + DFiesta tickets are $85 each. Los Angeles Times Food Bowl is an annual, month long festival celebrating the city’s dynamic food scene. Spanning the entire month of May, Food Bowl features many of the chefs and restaurants that have helped put Los Angeles on the map as a premier dining destination alongside world-renowned chefs in rare local appearances at hundreds of extraordinary events. Los Angeles Times Food Bowl charity partners are L.A. Regional Food Bank, Food Forward and Midnight Mission. Sponsors include Citi, Jose Cuervo, SOL, Topo Chico, Aeromexico and Mural Agua Fresca. For more information, please visit lafoodbowl.com and connect on Facebook, Twitter and Instagram @ LAfoodbowl (#LAfoodbowl #31DaysOfFood). 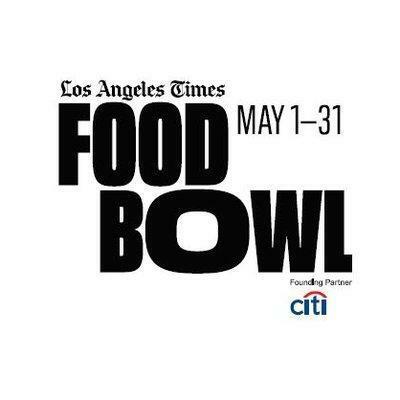 LOS ANGELES – April 1, 2019 – The Los Angeles Times announces the program schedule of almost 200 events for Food Bowl, its month long festival in May celebrating the city’s dynamic food scene. It will feature events with many of the chefs and restaurants that have helped put Los Angeles on the map, along with rare local appearances by internationally renowned chefs. The extensive lineup of dining events, panel discussions, chef collaborations, volunteer projects, and other food and drink-inspired happenings can now be found at lafoodbowl.com with a program guide to be distributed with the April 14 print edition of the Los Angeles Times. Enrique Olvera (Pujol, Mexico), Daniela Soto-Innes (Cosme, USA), Norma Listman and Saqib Keval (Masala y Maiz, Mexico), Gaggan Anand (Gaggan, Thailand), Virgilio Martínez (Central, Peru), Koji Kimura (Sushi Kimura, Japan), Angela Dimayuga (The Standard International, USA), Rodolfo Guzmán (Boragó, Chile), Musa Dağdeviren (Çiya, Turkey), Andrew McConnell (Cutler & Co., Australia), Dominique Crenn (Atelier Crenn, USA), Yu Bo (Yu’s Family Kitchen, China), JP Anglo, (Sarsá, Philippines), Tom Cunanan (Bad Saint, USA), Aaron Franklin (Texas), Pat Martin (Tennessee), Bill Durney (New York), Sam Jones (North Carolina) and Charles Michel (Oxford University Research Laboratory, Great Britain). are among the visiting chefs and experts scheduled to appear. L.A. chefs including Carlos Salgado (Taco Maria), Ori Menashe and Genevieve Gergis (Bavel), Niki Nakayama (n/naka), Adam Perry Lang (APL), Michael Cimarusti (Providence), Nicole Rucker (Fiona), Wes Avila (Guerrilla Tacos), Jordan Kahn (Vespertine), Suzanne Goin (a.o.c. ), Charles Olalia (Ma’am Sir), Dave Beran (Dialogue), Sang Yoon (Lukshon), Wolfgang Puck (Spago), Jessica Koslow (Sqirl), Nancy Silverton (Mozzaplex), Ludo Lefebvre (Trois Mec), Tim Hollingsworth (Otium), Jeremy Fox (Rustic Canyon) and Kris Yenbamroong (Night + Market) and many more will represent their hometown through special collaborations and events.